This comic comes from the mind of an eight-year-old named Malachai Nicolle and, in a good way, you can tell. Each page gets filled up with the kinds of crazy ideas that happen when you throw a bunch of action figures together and try to explain why what's happening. Hilarious stuff. 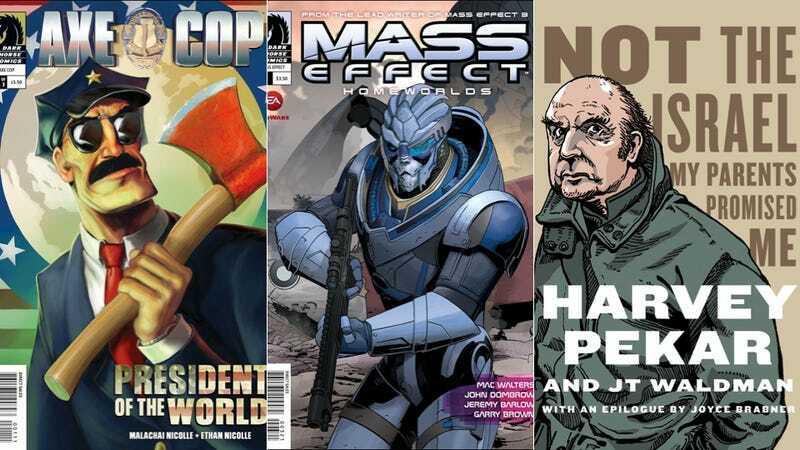 This issue of Dark Horse's video game tie-in series focuses on everyone's favorite Turian. This chapter sees Garrus on his native Palaven and also puts him on the prison planet Omega as he investigates a murder there. Hopefully, it's not going to be a bunch of calibrations, too. I always like Kid Eternity, the Golden Age teen hero who could call upon dead famous people to help fight evil. It was a morbid power to have, but one that makes it ripe for a modern twist. Jeff Lemire—who's holding down some of the New 52 DC Universe's macabre corners in books like Animal Man—should be a great fit for this re-invention of the 1940s character. I love how Ed Brubaker's espionage action series shows how paranoia can take a life of its own. Long after the Cold War's ended, Bucky Barnes finds himself having to clean up the messes from his own brainwashed past. With two main characters who were spies for both the U.S. and U.S.S.R., the adventures here serve as nice metaphors for how unfinished business can keep on complicating life for people who want to move on. Unless something else pops up at some later date, this could very well be the last piece of Harvey Pekar's incredible comics legacy. Focusing on the curmudgeonly writer's relationship with the idea of a Jewish state, this graphic novel should give readers a slightly more political take on Pekar's personality and worldview, making it more of a shame that he's no longer with us.